Avillanosa, A., Ecube, K., Española, M., Caipang, C., Palla, H., Becira, J. (2019). Effects of stocking density and artificial shelters during the nursery production of giant freshwater prawn, Macrobrachium rosenbergii (De Man, 1879) in net cages. Int. J. of Aquatic Science, (), -. Arlene L. Avillanosa; Krizia Meryl A. Ecube; Mark D. Española; Christopher Marlowe A. Caipang; Herminie P. Palla; Joel G. Becira. "Effects of stocking density and artificial shelters during the nursery production of giant freshwater prawn, Macrobrachium rosenbergii (De Man, 1879) in net cages". Int. 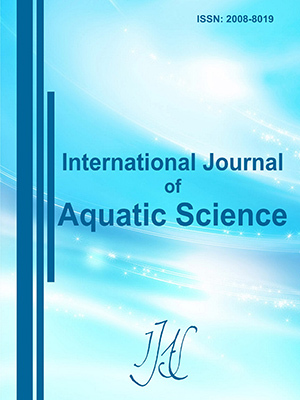 J. of Aquatic Science, , , 2019, -. Avillanosa, A., Ecube, K., Española, M., Caipang, C., Palla, H., Becira, J. (2019). 'Effects of stocking density and artificial shelters during the nursery production of giant freshwater prawn, Macrobrachium rosenbergii (De Man, 1879) in net cages', Int. J. of Aquatic Science, (), pp. -. Avillanosa, A., Ecube, K., Española, M., Caipang, C., Palla, H., Becira, J. Effects of stocking density and artificial shelters during the nursery production of giant freshwater prawn, Macrobrachium rosenbergii (De Man, 1879) in net cages. Int. J. of Aquatic Science, 2019; (): -. Relative performance of stocking densities and types of artificial shelters in the nursery production of the giant freshwater prawn, Macrobrachium rosenbergii in net cages was assessed. For the effects of stocking density, giant freshwater prawn juveniles (0.2 g ±0.001) were cultured in 12 75-L net cages within a 6 m3 concrete tank at stocking densities of 8, 15 and 30 individuals/net cage, and each net cage was provided with black polyethylene mesh nets as artificial shelters. For the effects of artificial shelters, the following materials were used: mesh bundles of used black polyethylene nets (Treatment 1), cut pieces of bamboo (Treatment 2) and PVC pipe stacks (Treatment 3), with triplicate for each treatment, was stocked with 15 individuals/net cage. No significant effects of the shelter types and stocking densities on most of the zootechnical parameters were obtained. Feed conversion ratio (FCR) and efficiency (FCE) were significantly better at lower stocking density. There were lesser variations in individual growth of the prawns in net cages that were stocked at a density of 15 individuals/net cage and provided with mesh bundles as artificial shelters, while the net cages with either cut pieces of bamboo or PVC pipe stack had heterogeneous growth during the latter part of the nursery rearing phase.